After a long break, I am back on the blog. I decided last March when my blog experienced some major difficulties, i.e., The “White Screen of Death” where all your content disappears, that I would make some major changes to the blog. I received extensive help from a professional and friend, Randy, and decided to overhaul the look of the blog. It took me a lot longer than anticipated and our beautiful southern spring turned into our relaxing but rather wet southern summer. Look at yesterday’s rain cloud. Multiply that by about 30 and you have the months of June and July. 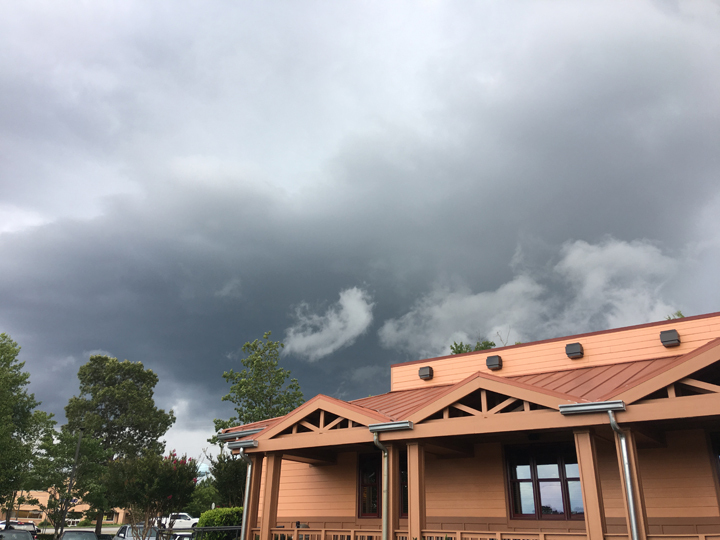 This is Longhorn Restaurant in an impending downpour. I thought I would be able to just upload my old blog into a new format. It worked for some of the content but not all of it. Then, I found out this new blog format analyzes my writing. Apparently I write too much in passive voice (or as I used to say “I have been writing in passive voice”) and I also do not use enough transition words. (See what I did there using “and” in my last sentence.) Even though I take each grammarly criticism personally, I have decided that I will prevail. It will take me a while to get everything transferred over but I promise to chip away at it until it is done. Southern Summer’s work will be stretching into fall and beyond! What Have I been Doing with my Summer? My last post was in April so what have I been doing? I finished up the school year – my 25th. Olivia graduated from college and then I got to enjoy my summer. I do love my summers off. I can’t imagine any teacher who would say they prefer year round school. Indeed I think most people would like year round vacation, but for now, that is for the fortunate retired folks and goofy twenty year-olds who put ridiculous videos on YouTube and make big bucks talking about tuna or other important ponderables of life. I am neither retired nor a YouTube sensation so I am now counting down the last few days of my wonderful southern summer. I have been to Wilmington, NC twice over the last few weeks. Olivia is attending graduate school at UNCW in the fall. Earlier we selected an apartment and scouted out her driving routes. Last week, we went to take delivery of her furniture and appliances. Very exciting! We didn’t get out of the rain though. 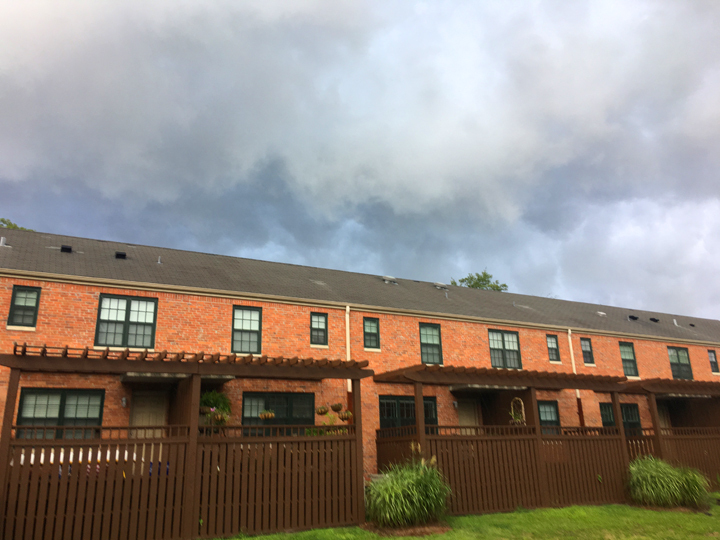 This is Olivia’s apartment in yet another impending downpour. Oddly, her apartment and Longhorn favor each other, but they are, in fact, miles away and one of them serves steak while the other will probably be serving Ramen Noodles. 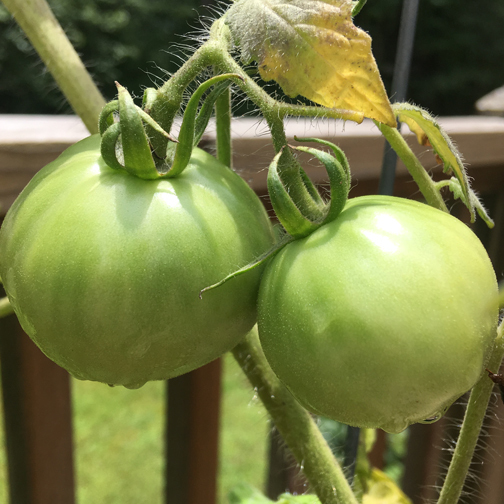 I usually try to grow tomatoes in the summer. This year I think we have had too much rain. My blossoms keep falling off and some of the leaves have turned yellow. But I have a few stalwart little fellows on the vine. 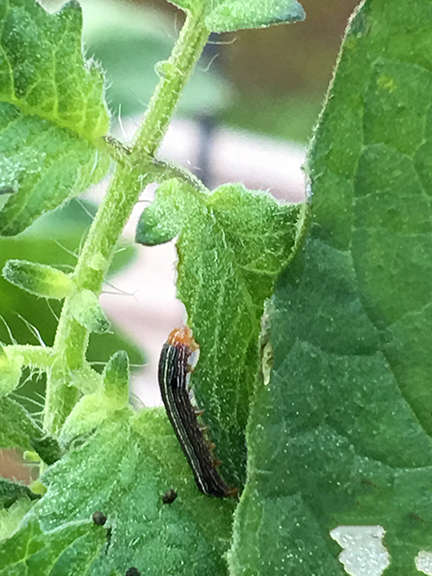 This friend got a free ticket to another bush after I caught him eating lunch on my tomato plant. Since my Apocalypse survival skills seem to be lacking, I am purchasing tomatoes for now. 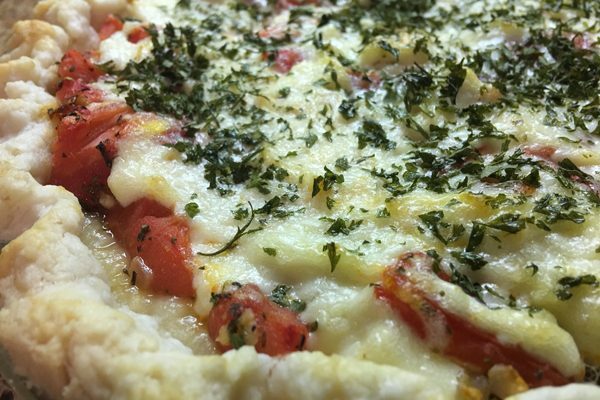 Today I made a Southern Summer Tomato Pie for lunch. It was worm-free and quite spectacular if I do say so myself. 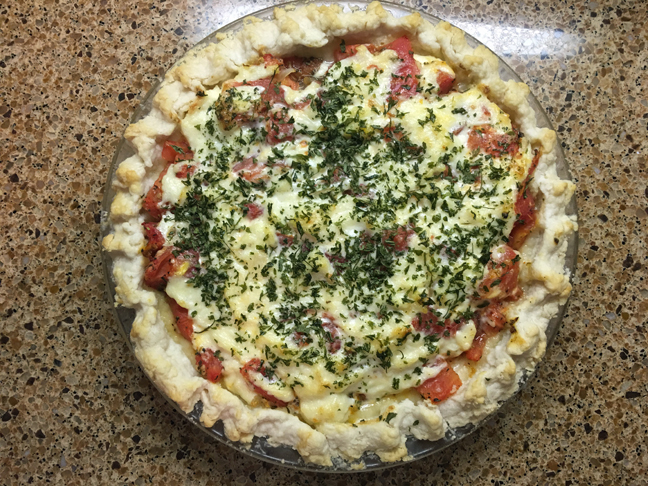 I like tomato tarts and pies and this one was perfect for another rainy day like today. The pie was warm from the oven and creamy from the cheesy topping. We loved it. You can find the recipe here or very soon in the new recipe section of the blog. I hope you will spend some time looking at the recipes I have already put in there. 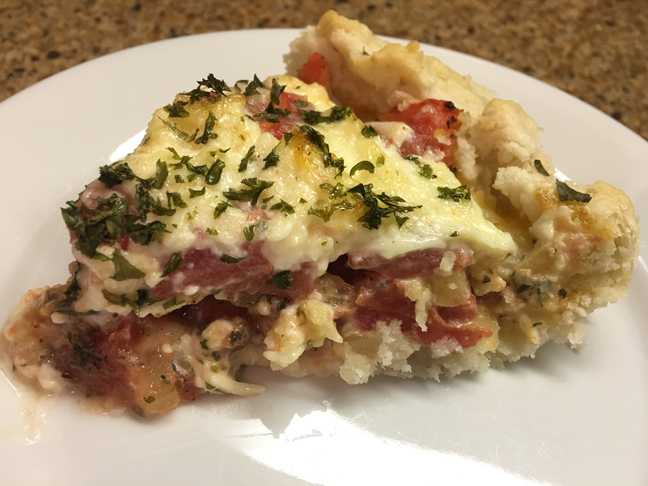 There are many more to add from the old blog, but I love browsing through the recipes in their new format and their updated descriptions. Preheat oven to 450 degrees. Brush the pie shell with milk and prick the bottom with a fork. Bake in 450 degree oven for 5 minutes. Remove from oven and set aside. Reduce heat to 400 degrees. Peel the tomatoes and cut into chunks. Set aside. Cook the onion and garlic in a teaspoon of olive oil over medium heat until softened. In a small bowl mix together the salt, Italian seasoning, onion salt, black pepper, basil, and thyme. Add the onions and garlic and the seasonings to the tomatoes. In another small bowl mix together the mayonnaise, lemon juice, and cheeses. Place the tomato mixture in the pie crust and spread the mayonnaise mixture on top. Garnish with parsley flakes. Bake in a 400 degree oven for approximately 25 minutes or until the top is slightly browned but not burned. I am thrilled to be back online and I plan to continue rewriting old content as well as adding new features to the site. It may be a little slow going at first, but just like the engine, I will keep working on it. I hope you like the new blog layout. I have to say a GIANT thank you to Randy for helping with it. He has endured all of my questions and has hidden his dismay at my lack of technical skills. Thank you! And thanks go to you – my patient readers. I enjoy my blog and I get discouraged with my time away from it. It is my hope that with this new format, I can be more consistent now and hopefully not experience another White Screen of Death. Let’s all keep our fingers crossed. What a treat…receiving your blog…you have turned out a great blog. Thank you! I’m excited about the new format. Thanks for reading along! Yay! I’ve missed your blog. So glad to see the new and improved version. It is a work in progress but I like all the new features of this template. Yay! Love the new look!! So glad you’re back!! Huge thanks goes to you and Randy. That’s for sure!!!!! Yay!!! I am so glad you are back. Love the new look.